Tag Archives: 한국 정부는 사드를 배치하기로 합의했어요. 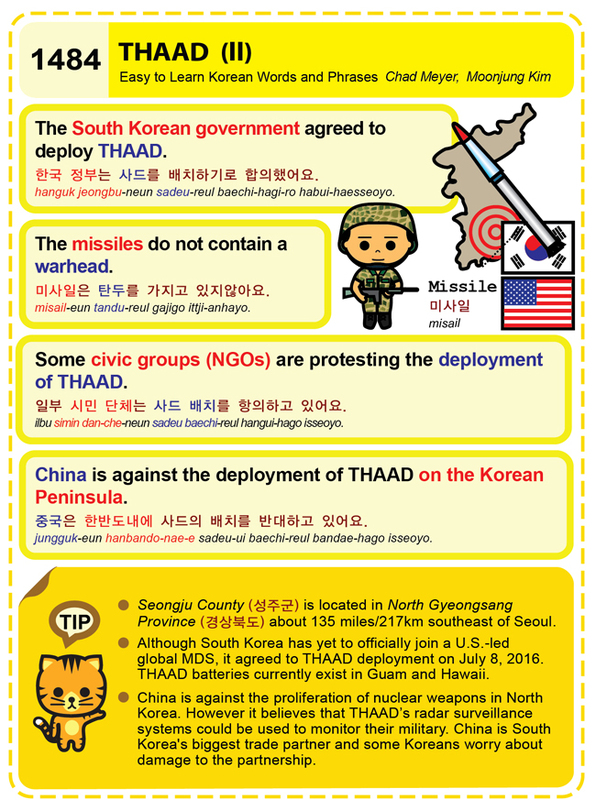 Easy to Learn Korean 1484 – THAAD missile defense system (part two). Posted in Series	| Tagged China, China is against the deployment of THAAD on the Korean Peninsula., Guam, Hawaii, missile defense system, North Gyeongsang province, partnership, radar surveillance systems, Seongju County, Some civic groups (NGOs) are protesting the deployment of THAAD., THAAD, THAAD deployment, The missiles do not contain a warhead., The South Korean government agreed to deploy THAAD., US-led global MDS, 경상북도, 미사일은 탄두를 가지고 있지않아요., 성주군, 일부 시민 단체는 사드 배치를 항의하고 있어요., 중국은 한반도내에 사드의 배치를 반대하고 있어요., 한국 정부는 사드를 배치하기로 합의했어요.